Nashville’s Music City Walk of Fame – home to stars like Johnny Cash, Loretta Lynn and Hank Williams – gets a new resident in August as Ben Folds is one of four music industry luminaries to receive a star on the famed walk. Folds has been honored not just for his musical accomplishments but for his support for the music business in his adopted home town. He called RCA’s historic Studio A his recording home for over a decade and prevailed in the face of efforts to demolish the landmark. He has also raised awareness of music education, classical music and the arts through his support and stewardship of the Nashville Symphony, Nashville Ballet and the George Center for Music Therapy. Folds and tourmates Cake will play a gig at the Ascend Amphitheater in Nashville on August 21, the evening of the ceremony. Tickets are on sale for the show. Along with Ben, other inductees include Brenda Lee, Ray Stevens and Jeannie Seely. 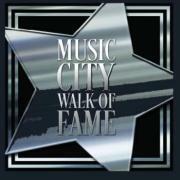 The Walk of Fame is along Demonbreun Street between 4th and 5th Avenues in Nashville’s Music Row across from the Country Music Hall of Fame and Museum. The induction ceremony is at 11:30 am on August 21 and is free and open to the public. look inside Ben Folds - So There By Ben Folds. Vocal Piano. Softcover. 72 pages. Published by Hal Leonard (HL.250595). The Magical Armchair mailing list is back! Subscribe to the Armchair-News list to receive an e-mail when new items are posted, or the Armchair reflector to chat with other Ben Folds fans. Looking for legacy Ben Folds Five info?